Built on the foundation of clinical efficacy, Lifeline has become a brand to be reckoned with, paving the way for skincare innovation with each new product. In the quest to stay forever young, our skin care experts have developed the most cutting-edge beauty breakthroughs by harnessing the power of pluripotent non-embryonic human stem cells, which work to visibly firm, tone, and erase unwanted signs of skin aging. Following the highly successful launch of Lifeline's flagship products (Daily Defense Complex and Night Recovery Moisture Complex) in 2010, the brand has only continued to expand its product line and push the skin care industry to new heights. 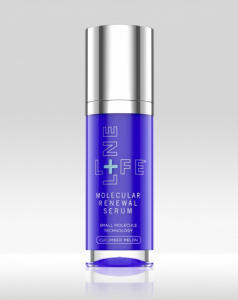 Now, with 11 consumer products under our belt, a notable fan favorite has emerged - Lifeline’s Molecular Renewal Serum. Why is this a fan favorite, you ask? Formulated with advanced small molecule technology and powerful antioxidants, this clinical-strength serum supplies skin with the calcium and essential amino acids needed to increase skin’s firmness, boost elasticity, and minimize the appearance of fine lines and wrinkles. Small molecule technology has the age-fighting power to work harder and more efficiently than retinol, without the harsh side effects commonly associated with retinol usage and with the added bonus of increased collagen upregulation. Other active ingredients include mushroom extract, which helps increase skin’s moisture retention, olive oil ester, which helps smooth the surface of skin, and niacinamide, which has anti-inflammatory properties. Our Molecular Renewal Serum is available in either unscented or scented. And the best part- our Cucumber Melon scent is free of synthetic fragrances and is made from 100% natural ingredients. Our promise to you is that ALL of our products are paraben-free, sulfate-free, and hypoallergenic. Plus, we never test on animals- cute, furry, scaly, or anything in between. Armed with these tips, you’ll soon be seeing the soft, supple skin you deserve!